Under the command of James Kirk (William Shatner), the U.S.S. Enterprise probes to the very edge of the Milky Way Galaxy. The starship follows in the footsteps of the SS Valiant, which disappeared on a similar probe two centuries earlier. A disaster recording probe from the Valiant is recovered, and it is learned from it that the ship’s captain ordered the vessel’s destruction following contact with a force field or barrier at the edge of the galaxy. After that incident, some crew members on the Valiant developed unusual psi powers. Recognizing that other ships will one day head this way, Kirk orders the Enterprise through the barrier at the edge of the galaxy, but the ship is damaged in the attempt, and two officers -- First Officer Gary Mitchell (Gary Lockwood) and psychiatrist Elizabeth Dehner (Sally Lockwood) -- are injured. 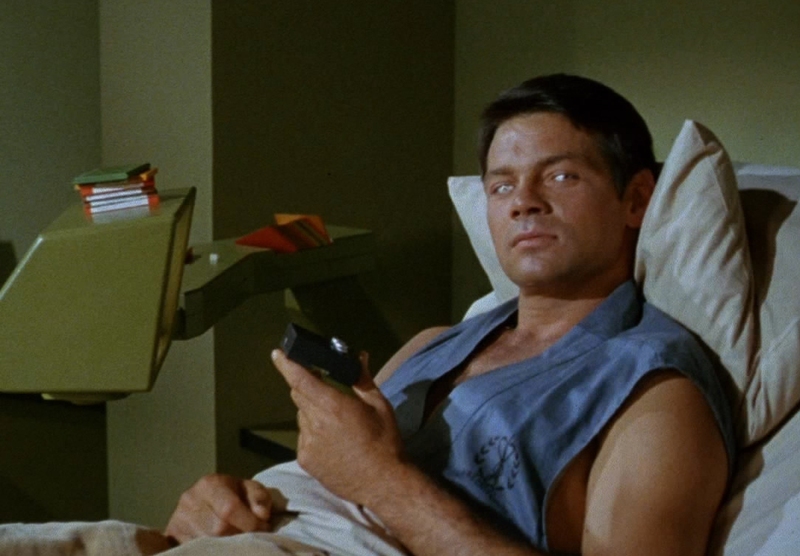 While repairs are effected to the Enterprise, Mitchell begins to develop frightening psionic or ESP abilities. Spock recommends marooning the evolving human at an automated lithium cracking and “galactic mining” station on lonely Delta Vega, and Kirk comes to realize he has no choice, lest he be forced to make the same decision that the Valiant’s captain did two hundred years earlier. 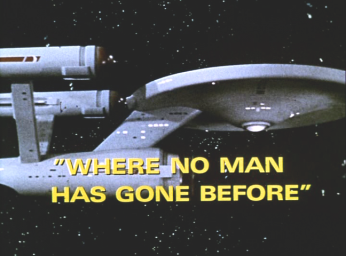 “Where No Man Has Gone Before” is the episode that sold Star Trek (1966-1969) as a series, and therefore, the series episode that, we might fairly state, initiated a beloved franchise. Written by Samuel Peeples, the adventurous story concerns a dear friend of Kirk’s, Gary Mitchell, who is altered by psionic powers, becoming a God-like being in the process. 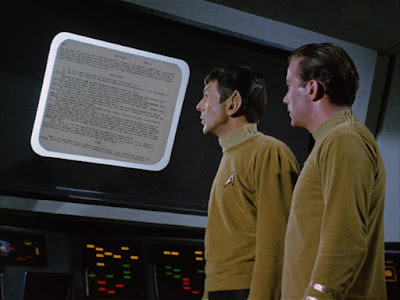 In very real terms, the story is an important first command test for Kirk. Is Jim Kirk able -- despite his intense emotions -- to see this situation clearly? Is he able to safeguard his ship and put aside his friendship for Mitchell? Structurally, one can see (the brilliant) format of the original Star Trek forming before our eyes with this episode. The triangle, or triumvirate, is often called, is beginning to grow apparent. At the upper point of the triangle we have Kirk, the decision maker. At one point below, we have the case for logic and rationality as represented by the apparently-heartless Spock. And on the last corner, we have the emotional or human argument, urging humanity, sensitivity, sympathy and understanding. Kirk must, throughout the course of the series, consider those often opposing philosophies, and make a choice that impacts the lives, literally, of millions. He must show the wisdom of Solomon. I note that the triangle is forming, because it is not complete. 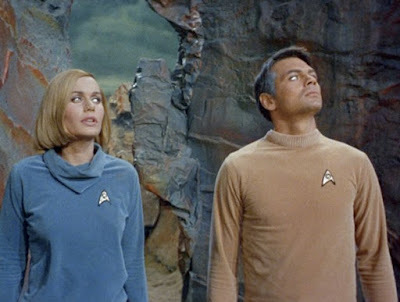 Although brilliantly-played by Sally Kellerman, Dr. Dehner in "Where No Man Has Gone Before" is not an appropriately grounded voice for the “emotional” arguments being presented to Kirk. One senses that she is attracted to Gary, and taken with her ideas of “improving the line” (perfecting the human species). She is not a fair, impartial arbiter, in other words. 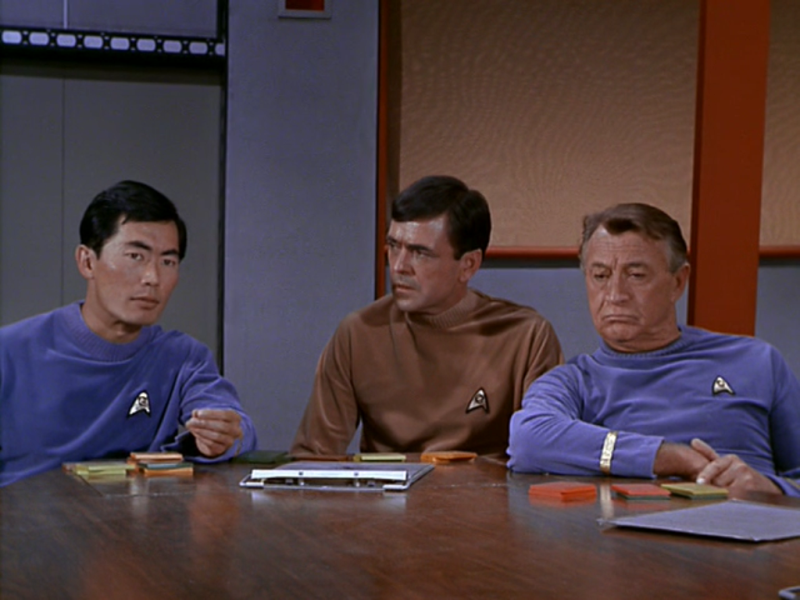 In other episodes, of course, we have Dr. McCoy to passionately argue the humanistic side of the equation in the structural/character triangle. “Where No Man Has Gone Before” obsesses on Kirk’s position, and dilemma. Is it right to imprison, maroon and kill a friend who exhibits signs of becoming dangerous? Is it irresponsible not to do so, given the abilities Mitchell demonstrates? 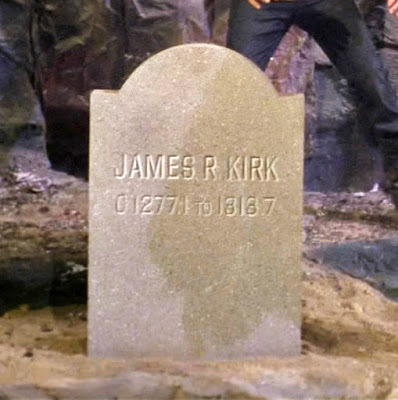 Kirk serves as an almost Hamlet-like figure in this episode, torn between viewpoints, and unable to act until it is almost too late to do so. We don’t often see Kirk paralyzed by his choices, but it is appropriate that he is seems so torn in this case. He risks not just losing a crew-man, but, ostensibly, his best friend on the Enterprise. He notes for example, that he has been friends with Mitchell for fifteen years, since their Academy days. Spock’s arguments are logical, but ruthless, and that ruthlessness is a brand of noise, one might say, that jeopardizes his message. Kirk can’t countenance a brutal decision made brutally, if that makes sense. 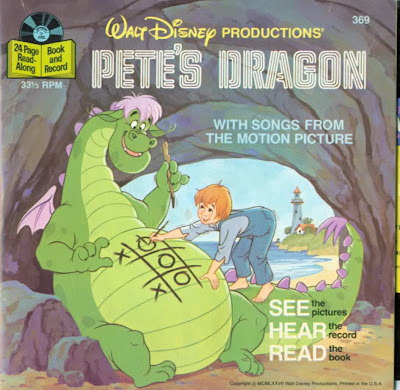 He must, as he notes in a later episode “feel his way” through the decision process. The human side of this debate may also seem inadequate because as viewers, we clearly recognize the danger Mitchell represents. As soon as we see those (marvelously effective) silver eyes staring at us, we know that Mitchell is trouble. We see him as a villain and a monster, rather than as merely an evolved man, and so we come to agree with Spock’s sentiment, if not the (emotionless) way he delivers his analysis. It might have been intriguing for Mitchell to go through some intermediate states of development wherein he doesn’t seem like a threat, just different. Had we seen that progression, we might be more inclined towards Dehner’s belief that he is not dangerous, merely a new stage in human evolution. What may be most interesting about “Where No Man Has Gone Before” -- and this fascinates me, endlessly -- is the visualization of the show's universe. We see a different set of Starfleet uniforms. e see a different communicator and a bulky phaser rifle. We meet different crewman, like Dr. Piper and Mr. Kelso, too. There is no sign of Dr. McCoy or Lt. Uhura. Scotty wears a gold command shirt, and Mr. Sulu is a physicist who offers Captain Kirk “the mathematics” of a given situation. The background terminology is different too. The transporter is called a “materializer” for example, and the ship’s intercom is referred to as “intercraft” communication. Similarly, when the Enterprise comes to a stop, Kirk orders the helmsman to “neutralize” warp. Again, not a common term in the standard Trek lexicon. Similarly, we learn that the Enterprise runs on “lithium” crystals, rather than the Dilithium Crystals of canon. Even Spock’s background seems a bit vague. 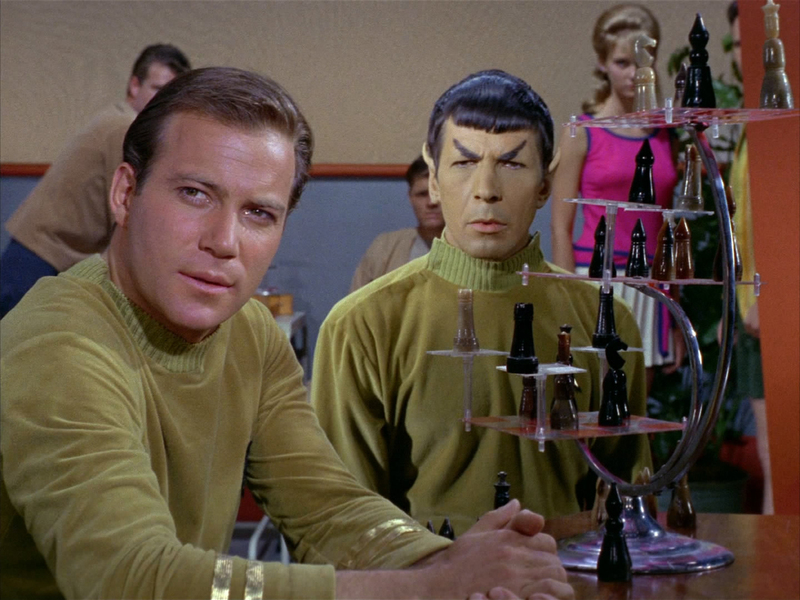 He notes, while playing 3-D chess with Spock that one of his ancestors married a human female. That ancestor, of course, is his father. In the early episodes of Star Trek (such as “The Corbomite Maneuver,”) Spock refers to his parents in the past tense, though by“Journey to Babel” we see they are very much alive. I have always rather liked the fact that “Where No Man Has Gone Before” appears to have taken place in a slightly different world than do the other episodes. Between “The Cage” and “Where No Man Has Gone Before,” we get the sense that there is a larger universe out there, one with changing fashion, changing technology, changing energy sources, even. I don’t see the changes as continuity errors, but rather as a sign that Star Trek presents a living, growing universe. I do wonder, however, what original viewers must have thought on first run while watching this installment. Were they asking: where's McCoy? Why is Spock's shirt gold instead of blue? Did they think that the third episode was presenting a new format/new look? One very nice aspect of “Where No Man Has Gone Before” involves the background we get on Kirk. That’s a far cry from the more devil-may-care attitude that many casual fans think of when they imagine Kirk. The reboots, set in an alternate reality, change Kirk to that kind of character. He’s hardly a stack of books with legs. William Shatner is very good in his first Star Trek appearance here, though a little too furtive and unsure for my test. That approach fits in with the story and Kirk's Hamlet-like dilemma, but may not have worked, overall for the character. Look at Kirk on the bridge as the ship approaches the barrier for the first time. He is craning his neck, constantly looking at everyone else for reassurance, visibly worrying too much, and not demonstrating the confidence a starship captain must possess. “Where No Man Has Gone Before” resolves in a fist-fight and with an obvious lesson -- “absolute power corrupts absolutely” -- and yet it also establishes another trademark of the series. Kirk draws Dehner to his side of the conflict with Mitchell by appealing to her humanity and sense of duty. He reminds her that she is a psychiatrist and asks for a diagnosis of Mitchell. He asks her if she likes what she sees. A key element of Kirk’s character throughout the series is his ability to craft a persuasive argument from the two world views that inform his world (logic and emotionalism). In terms of Star Trek's prophetic nature "Where No Man Has Gone Before" predicts that we will have electronic readers in the future so as to read books in that fashion. Yep. A trilogy of how to create a great science-fiction series by revising both production design and cast. Watching Star Trek in reruns as a kid, my initial thoughts upon seeing this episode was that it was filmed first, and that's why it looked so different. I later learned that this was precisely the case. Not sure if that helps, but the station that used to play the episodes - WGN - aired them in the order that they first aired on NBC. 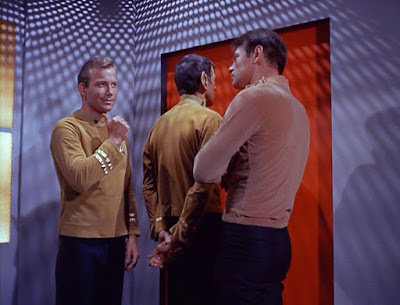 That still shot of Kirk, Spock and Mitchell in the turbolift reminded me that they employed a neat effect: we see the outside corridor and extras walking by when the men enter the turbolift. The camera remains in place and when the doors open, what we now see is the bridge of the Enterprise. This is the first time the technique appeared in the series. JJ Abrams also used this trick in the first Star Trek film. 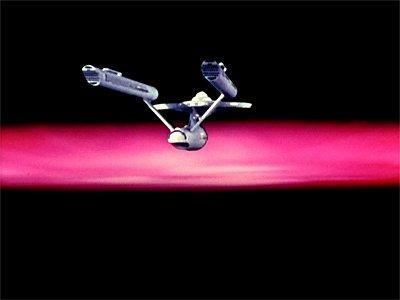 Trivia: NBC had a lack of finished episodes in its hands when Star Trek's third week rolled around, so they opted to show "Where No Man Has Gone Before". 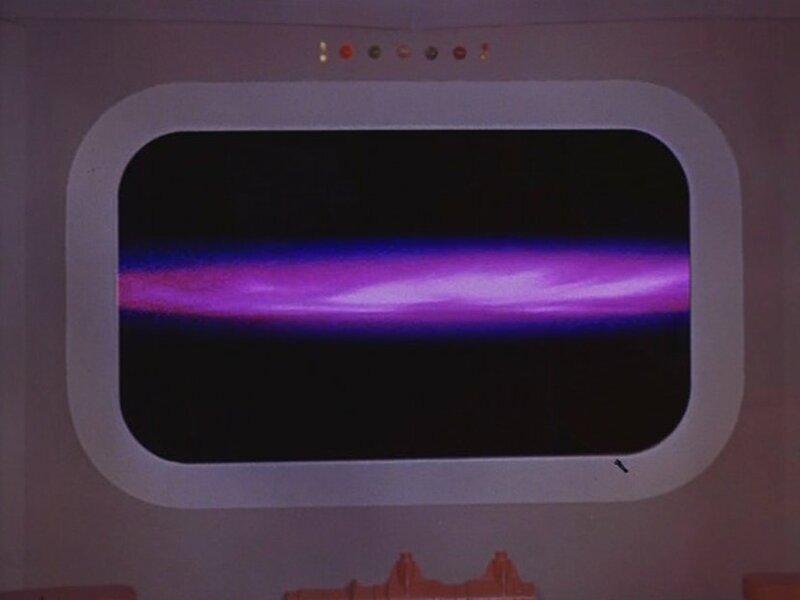 "The Corbomite Maneuver" was the first episode shot in regular series production, but its visual effects load pushed it back to a later date. Also: Upon airing, WNMHGB won its timeslot. This episode (the second pilot show, of course) was budgeted for $215,644 but ended up costing $354,974 --a few steps down -- no surprise -- from "The Cage" and its comparative numbers of $451,503 & $615,751. At The X-Files Lexicon: "The New Associate"
Ask JKM a Question: Favorite Movie Scenes?